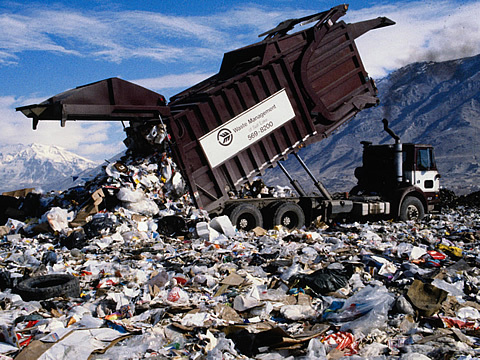 UberTechBlog: Can Municipal Waste Power Our Cars? One future source of green energy may be as close as the nearest dumpster thanks to companies vying to make fuel from trash. Enerkem, based in Montreal, and Fiberight, in Maryland, hope to turn municipal waste into energy in new biorefineries. Enerkem has been around since 2000 and owns several facilities in Canada. Its pilot plant, in Sherbrooke, Quebec, turns used electricity poles into methanol, acetates, ethanol and syngas. Future plants will use municipal waste as a feedstock. Recyclables are sorted out of the waste and the remaining material is heated to 750 degrees Fahrenheit until it emits hydrogen-rich gas. Carbon dioxide and other impurities are removed from the gas, and a catalyst turns some of the hydrogen into methanol, which can be further processed into ethanol. The heat created during the process can be used to create electricity or boil water. Fiberight, founded in 2007, focuses on producing cellulosic ethanol. In addition to municipal waste, the company makes energy out of materials such as road fiber and fire retardant panel board. A future Enerkem plant, in Edmonton, Alberta, will rely on an annual 100,000 tons of the city’s municipal solid waste to produce 10 million gallons of ethanol and methanol. Alberta’s government is supporting the plant with a $23 million grant, and Alberta Energy is pitching in $3.35 million as well. Oil giant Valero and trash experts Waste Management are both investors in the company. Enerkem hopes to open a plant in Mississippi with the help of $50 million from the U.S. Department of Energy and an $80 million loan guarantee from the U.S. Department of Agriculture. Biorefineries using waste to make fuel may not make a huge dent in landfills anytime soon, but if successful, they could help reduce the amount of garbage that goes to waste.